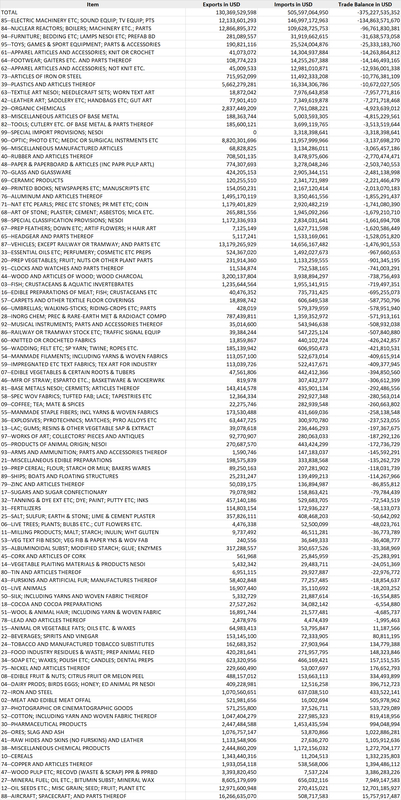 We wrote about average import tariffs or custom duties per country, the United States has the 13th lowest tariffs in the world (out of the 165 members of the World Trade Organization) at only 3.48%. The WTO number is averaged across all products; the actual tariffs could be different based on the product mix of imports as well as any special trade deals the country may be part of. In the case of the U.S., the actual import tariff or custom duty was just $38.49 billion or 1.65% of the value of $2.34 trillion in imports in 2017. Canada was the largest export market with exports of $282.47 billion in 2017. Canada was also the third largest market for imports behind only China and Mexico with total imports of $299.98 billion and a trade deficit of $17.5 billion. The trade deficit itself with Canada was the 12th largest for the U.S. in 2017. The U.S. had exports worth $284 billion to the 28 European Union Countries in 2017, beating Canada with $282.5 billion of exports in 2017. The U.S. had imports worth $435 billion from the 28 European Union Countries in 2017, the total trade deficit for the U.S. with the European Union was $150 billion, second only to China. If security is indeed the concern, then why not charge China tariffs on Nuclear Reactors and associated equipment? Chinese companies paid an average of 2.5% (or $12.54 billion on exports of $505.60 billion) in tariffs on exports to the United States in 2017. U.S. companies paid an average of 7.9% (or $10.29 billion on exports of $130.37 billion) in tariffs on exports to China in 2017. The steel tariff is intended to increase domestic steel production from its present 73% of capacity to approximately an 80% operating rate, which isn’t much. The aluminium tariff is intended to raise production of from the present 48% average capacity to 80% which could turn out to be quite good for the United States. Canada accounted for the largest share of U.S. steel imports by source country at 16 percent (4.3 mmt), followed by Brazil at 13 percent (3.6 mmt), South Korea at 10 percent (2.7 mmt) in 2017. U.S. Secretary of Commerce Wilbur Ross has initiated an investigation under Section 232 of the Trade Expansion Act of 1962. The investigation will determine whether imports of automobiles, including SUVs, vans and light trucks, and automotive parts into the United States threaten to impair the national security as defined in Section 232. New car output in the United States is close to a 43-year low as Americans are buying fewer new cars and factories in the U.S. are producing fewer cars. U.S. manufacturing has been growing but it isn’t generating too many new jobs. Firstly, that President Trump is doing what he promised on trade, whether that is good or bad is debatable. Secondly, the recommendations of the Department of Commerce on trade tariffs are largely being implemented. The Steel and Aluminium tariffs are a good reference point. Thirdly, tariffs might force manufactures to change strategy and move at least some manufacturing to the United States. And not just because the tariffs hurt financially but the talk of tariffs invokes uncertainty. And businesses hate uncertainty.